In this polymer clay tutorial, I explain how to sculpt by hand tiny phalaenopsis orchid flowers, how to make leaf canes with delicate lace-like design, and how to apply these sculpted details to a manufactured pendant. I also explain how to make a necklace with this pendant. 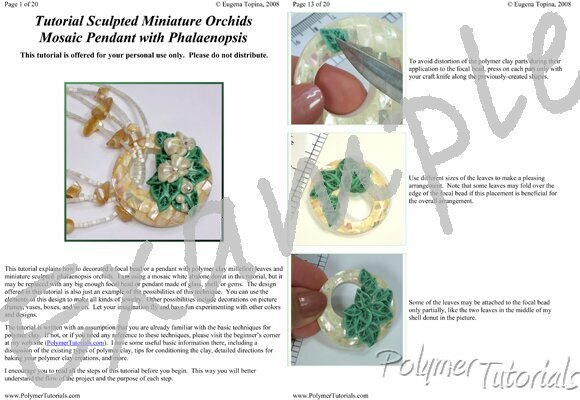 The first two pictures on this page show the necklace described in this tutorial. The last two pictures demonstrate the possibilities of the techniques explained in this tutorial. Place a mouse over the small pictures to see them enlarged. Wonderful tutorial, very detailed explained! It's a worth to ..